Rt Timbul: Crucifixion nails found? Two thousand years have passed since Jesus Christ died on the cross and Christian theologians still debate whether he was crucified with three or four nails. But Canadian-Israeli film director Simcha Jacobovici claims there is good evidence to believe that he has found two of them – and that these ones may be authentic. Jacobovici says he has historical and archaeological justification for his claims. 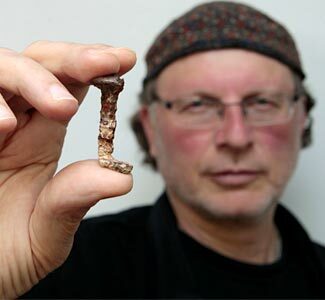 "What we are bringing to the world is the best archaeological argument ever made that two of the nails from the crucifixion of Jesus have been found," he told reporters at an impromptu press conference in Jerusalem today. But in an interview with ABC's Alexander Marquardt these evening, he was more cautious about his claims, "I don't think the story here is 'nails of the cross found, exclamation mark.' I think the story is 'nails of the cross found, question mark?'" He explains his supposition in a film, "The Nails of the Cross," which documents three years of research. But many experts say his case is far-fetched, requiring much imagination ... and a leap of faith. But as he told ABC News, "I brought the story to the world and what we should do now instead of scoffing is study." He added, "Is it possible? A lot of the things we thought impossible turned out to be possible." A spokesperson for Israel's Antiquities Authority expressed skepticism: "There is no doubt that the talented director Simcha Jacobovici created an interesting film with a real archaeological find at its center, but the interpretation presented in it has no basis in archaeological findings or research." The film begins by revisiting an ancient grave in Jerusalem's Old City, first discovered in 1990. Two iron nails were found there and, according to the film, mysteriously disappeared shortly afterwards. Jacobovici says he tracked them down years later, in a Tel Aviv laboratory where ancient bones were analyzed. The tomb is believed to be that of the Jewish high priest Caiaphas. According to the New Testament Caiaphas presided over the trial of Jesus and sent him to the Romans and on to his death by crucifixion. He may then have wished to be buried with the nails linked to his name. To support his theory, Jacobovici explained to ABC News, "Caiaphas is not identified with the crucifixion of thousands of people. He's gone down in history associated with the crucifixion of one person only and that is Jesus."